This year’s 24 Hour Comic Book Day is approaching and we are now registering artists who would be like to be involved in the event. 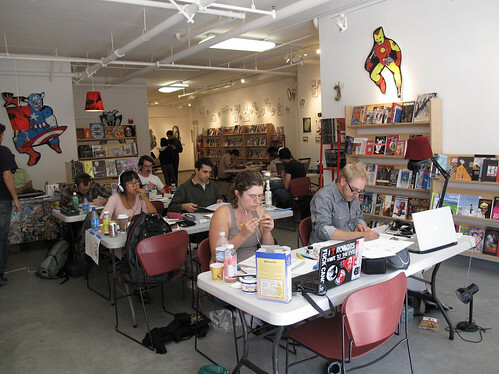 During 24HCBD artists from all over the world attempt to create their own 24 page comics in a 24 hour period. The Cartoonist Conspiracy has been involved with the event started in 2004 and every year we have more and more cartoonists take part. This year’s event starts at 11am on Saturday October 2nd and will end at 11am on October 3rd. We have two awesome comic shops hosting us this year; Mission Comics & Art (in SF) and the awesome Comic Relief in (in Berkeley). Both shops are only hosting up to 12 cartoonists, but we are working with some other shops in the city too if we need additional space for cartoonists to participate. If you’d like to sign up for this year’s 24HCBD in the Bay area, please email me (Doc) at yoyogenius at gmail dot com with “24HCBD” in your subject. Please let me know your name and which location you’d like to work in. If you haven’t made a 24 Hour Comic yet, I highly recommend it. Of course, anyone can make a 24 Hour Comic whenever they want, but there’s nothing better than hanging out in a room full of cartoonists as they slave away on their comics! If you have any questions please feel free to contact me. Also, if you know any other comic book shops in the Bay that may be interested in hosting 12 cartoonists for 24 hours, please let me know. For anyone interested, I’ve posted a few of my previous 24 Hour Comics online. Read my 2008 comic Robots Don’t Know Anything About Twitter here or last year’s Boof here.